Looks like we are on a world record kick this week. Yesterday we looked at the World's Smallest Drone and today we review the World's Fastest WiFi Router - the NETGEAR Nighthawk X10 AD7200 Smart WiFi Router. 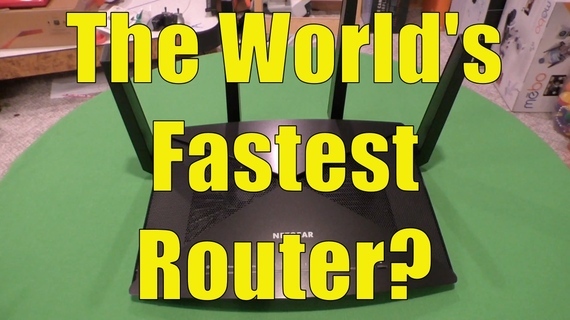 Is The Nighthawk X10 really the world's fastest router? How fast can it go? Is it really worth spending $450 on router when you can get one for $50? These are the questions we set out to answer as we did a few weeks of real world testing with the Nighthawk X10 (a big thank you to NETGEAR for supplying the router in exchange for our honest review). The Nighthawk X10, Expensive Router or Cheap Computer? Some people will look at the AD7200 Smart WiFi Router and say, impressive specs, but $450 is way too much to spend for a router. If the AD7200 was your "typical" router, that logic would make perfect sense. The AD7200 is actually far from your typical router and in some ways more like a computer than a router. You have 1.7 Ghz Quad Core Processor. Not one, but two USB 3.0 jacks. The ability to run a Plex Media server direct from the router - no computer needed. In many ways, the $450 price looks much more reasonable if you consider the AD7200 not just the World's Fastest Router, but also a relatively cheap computer! 802.11ac and 802.11ad and 2.4Ghz, 5Ghz and 60Ghz - What Does It All Mean? If you have PCs, tablets and phones that you purchased in the last couple of years, you mostly likely have equipment that can handle the 802.11ac WiFi standard. Using the 2.4Ghz or 5Ghz band that 802.11ac occupies, you can get decent spends and pretty good range. As we write this in January 2017, there is very little hardware that can handle 802.11ad. This WiFi uses the 60Ghz band, gets incredible speeds (up to 7 Gbps) - but has a short range. As we move into mid 2017, there should be more and more hardware that takes advantage of 802.11ad. The great thing about the Nighthawk X10 is that it can handle both 802.11ac and 802.11ad. This means if you buy this router today you will not have to replace it in 6 months or a year when 802.11ad is more popular. In a way, you are future-proofing by investing in the Nighthawk X10 today, even if you can't use it to its full speed potential right now. Should You Buy The Nighthawk X10 AD7200 Smart WiFi Router? If you are looking to get the fastest router on the market, with an incredible feature set, and not replace it within the next year - yes, you will want to get the Nighthawk X10. If you only pay for 50 Mbps Internet speed and don't need a Plex Media server and all the bells and whistles, no need to shell out $450 for the Nighthawk X10. Do you like the idea of advanced features, great WiFi range and squeezing every last bit of speed out of your WiFi, but have a limited budget? Then you might want to go with the NETGEAR Nighthawk X8 (AC5300) that sells for $350. The AC5300 is plenty fast, but lacks the 802.11ad support and the Plex Media server. The good news, it is $100 cheaper than the AD7200 and still a feature packed router. In the end, we are big believers that your whole system is only as strong as your weakest link. You should buy the best equipment that your budget allows. If your budgets allows for a $450 router, you will NOT be disappointed in the super fast and feature packed Nighthawk X10 AD7200. Watch Our Full Video Review of the NETGEAR Nighthawk X10 (AD7200) Smart WiFi Router. Read Our Review of the NETGEAR Nighthawk X8 (AC5300).